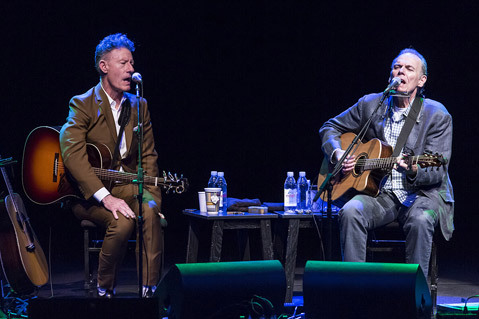 Not long enough ago, Lyle Lovett and John Hiatt played at Campbell Hall, same format as this—two alt country 1990s stars across from each other, chatting in whimsical hipsterish style, like stage musicians do, and alternating tunes. Like last time, they played their most fondly-held hits. For Lovett that means a trio of big ones — “She’s Already Made Up Her Mind,” “Church,” and “If I Had a Boat” — and a few others. For Hiatt, it would be “Have a Little Faith in Me,” “Drive South,” and “Thing Called Love.” They were all there. Admittedly, some people didn’t see the show last time, and admittedly, some other songs played were fine showcases for these great singer-songwriters. But the show was both moving and rote. It made you pine for an in-depth concert from either. Two years ago, I wrote “it’s a strange marriage that works,” referring to the show. But now it seemed like a relationship unraveling. They are kind to each other—I would guess real friends—but the banter was forced, and the genius of Lovett, with his rich buffet of ironies and quirky topics, seemed poorly matched by the folksy (but clearly passionate) Hiatt. The most potentially moving aspect of the evening was the second song in, when Lovett did an elegant reworking of Chuck Berry’s unknown masterpiece, “A Brown-Eyed Handsome Man.” It was an opportunity to launch into the idea that the history of Black Lives Matter didn’t begin two summers ago. But the conversation never rose above an anecdote about meeting Berry on a staircase, turning an epiphany into gossip. Hiatt’s guitar work was off at times, but beautiful at other moments, and he seemed to be trying to break into a more jazzy line of work. But “The Open Road” was beyond moving. As for Lovett, let’s face it: he is an artist who needs a full evening and a large band. We all secretly wanted that. When he sings, “She’s No Lady,” we all know he belongs in the American songbook forever. He’s the latest improvement. Somebody, please, bring him back alone.